Women are facing a breast cancer epidemic in 2012 after more than 30 years of “awareness” campaigns and billions spent on pink ribbon products. It is time to put breast cancer front and center in the national debate and get serious about our government’s role to address and end this public health crisis. During this year’s election season, when healthcare is a central focus of national attention, Breast Cancer Action is demanding meaningful action from legislators on breast cancer. We will not let our government outsource its job to protect public health to Komen and Avon, or other charities or organizations that are beholden to corporate interests. Nor will we allow our public officials to engage in ‘political pinkwashing’ by claiming that they themselves care about breast cancer without actually initiating or supporting policy changes that significantly help women living with and at risk of breast cancer. Each year, for the past 10 years, Breast Cancer Action’s Think Before You Pink® campaign has confronted the flood of pink products sold in the name of “awareness” by highlighting the hypocrisy of the worst pinkwashers– the companies or organizations whose pink products contribute to increasing our risk of developing the disease. This year we are calling upon policy makers and elected officials to support strong regulation and independent research. As long as corporations dump pollutants into the air, the water, and the products they sell, and pharmaceutical and biotech firms care first and foremost about making money, we will need government action. It is our government’s job to monitor and regulate industry in order to protect public health. Breast Cancer Action demands that our public officials and elected leaders stop political pinkwashing, get serious, and endorse the 2012 Breast Cancer Action Mandate for Government Action. Flood their inboxes: Demand that legislators from across the U.S. step up to end the breast cancer epidemic by publicly supporting the 2012 Breast Cancer Action’s Mandate for Government Action at www.bcaction.org. Take over Facebook: Share Breast Cancer Action’s “It’s An Epidemic, Stupid!” logo on your Facebook pages to encourage conversation and encourage people to take action. 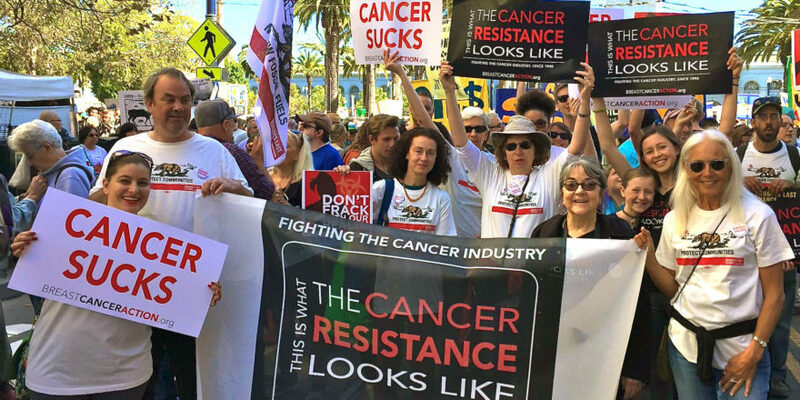 Occupy this Election: Use Breast Cancer Action’s Critical Questions for Conscious Voters to evaluate elected leaders and candidates running for office. Together, we will put breast cancer front and center in the national debate and demand our representatives take meaningful action to address and end this epidemic. Join us! As an elected official deeply concerned about the devastating personal effect and public health impact of breast cancer in my community, I recognize and accept government’s unique and essential role in addressing and ending the breast cancer epidemic. I commit to use my power in public office to represent the interests of my constituents living with and at risk of breast cancer by promoting legislation and public policy solutions that move beyond the limitations of screening and awareness to fully address and end this epidemic. Sufficient funding to disseminate and implement research findings so that relevant results get in the hands of breast cancer activists across diverse communities. Provide sufficient funding to monitor and enforce regulatory protections of public health. I will evaluate all legislation and public policy that affects women living with and at risk of breast cancer in accordance with these principles for action and hereby commit to put patients before profit and protect the health of members of every community.